The industrial Lohmeyer edgebanding machines of the KAM 780 IQ series were already presented at the Ligna 2017. The high demand from suppliers and industrial customers have prompted Lohmeyer to add further series to its portfolio. As the systematic refinement of the KAM 780 IQ, Lohmeyer is presenting the KAM 792 IQ with a PU system and a return system at Ligna 2019. The claim of the KAM series is to combine a high feeding speed with maximum flexibility. An automatic edge magazine and pneumatically adjustable double units (fine milling and profile scraping) are the perfect basis for a flexible industrial production. The quick-change glue system enables fast changing of different edge colors. A pre-melting unit ensures an optimum glue temperature at all times and protects the glue from burning. A fiber-reinforced V-belt system maximizes the stability and synchronicity of the workpiece transport and protects the panel surface. Various spraying devices, oscillating buffing wheels and eight suction connections protect the tools and ensure a clean workpiece surface so that the thrust rings can perform their work precisely. This ensures a perfect finish even at high running speeds. The feed rate of KAM 792 IQ is up to 26 m/min depending on the selected aggregates, when corner rounding is activated the maximum feed rate is 20 m/min. 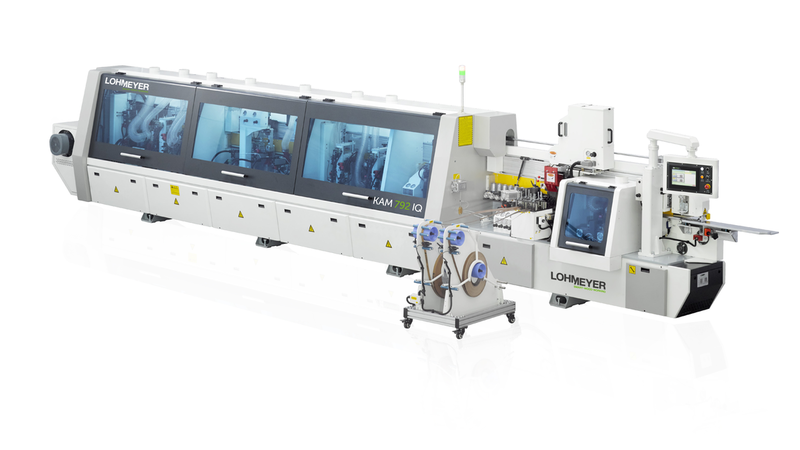 As all Lohmeyer machines also KAM 792 IQ scores with an optimum price/performance ratio. Lohmeyer implements return systems as well.